I have moved certain sections (downloads, music, pictures) of my user directory from my SSD to my HDD via symlinks. I have successfully changed over the image of the folder which can be seen in the finder. After removing the original folder the item is also removed from the sidebar, after creating the symlink I have added the folder back to the sidebar but have noticed that the default icons for such folders is no longer present and simply presented using a blank blue folder. How can I get the original icons displayed in the sidebar? Now you will have to manually change the icons for the respective folders by using Get Info on the folder that is in your sidebar and by dragging and dropping the icns file onto on the Inspector panel. open each one of these in Preview.app. * some people have an Applications folder in their Home folder, some do not. * will probably still have both of those for Legacy compatibility. To Verify you have done this correctly, switch to Column View in your home folder, select one of the special folders, make the preview column and the window very large. If it's not pixelated, you'll be fine. The method in this video works for me (10.9). Drag your folder to the sidebar to create a link. On the normal folder that have the icon on it, press Cmd-I, click on the icon, and press Cmd-C. I am pretty sure none of these approaches actually works, at least in El Capitan. The best approach I have found is to keep the special folders in your home directory and sidebar, and symlink out the subfolders. So, e.g., I have a real Music folder in ~/, but inside that is a symlink to /Volumes/[external]/Music/iTunes/. That gets the 100Gb of iTunes content off my main volume but keeps the sidebar icon. Less elegant but I don't think anything else works. Note that if you already screwed up and deleted the special folder in your user directory, you can indeed su cp an empty special folder (e.g. ~/Music) from a new user you create, and it will work - even the permissions will probably automatically update, but check. Not the answer you're looking for? 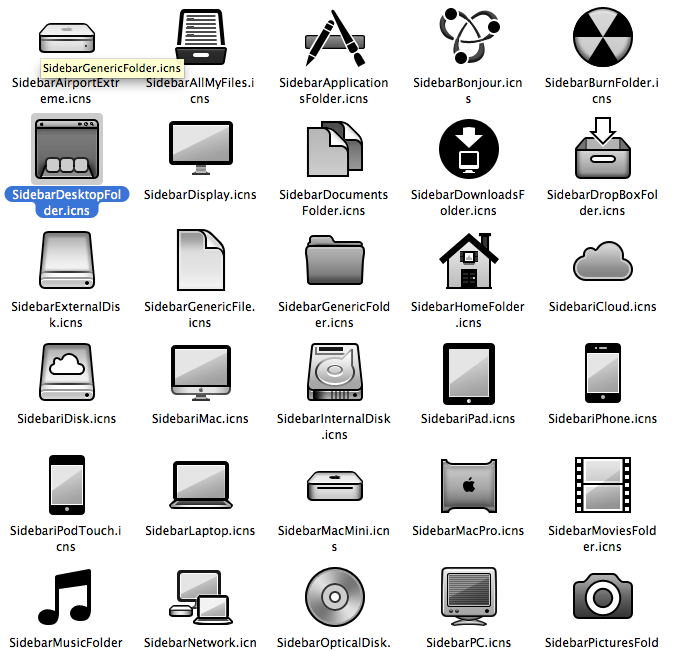 Browse other questions tagged macos mac finder icon symlink . Symlink User Folders - Can I keep original Sidebar Icons?